ETON FR1 Windup Flashlight and Digital AM/FM/NOAA Weatherband Radio - Perfect for Any Emergency! Get ready for all types of bad weather and disasters, including: snow and ice storms, power outages, hurricane season, tornadoes and thunderstorms! The Eton FR1 Emergency Radio is a self-powered L.E.D. flashlight and digital AM/FM/NOAA weatherband radio. It features a high efficiency dynamo charging system that provides up to 20-30 minutes of light or 30-45 minutes of radio from 2-3 minutes of winding. The unit also features a glow-in-the-dark ring - allowing you to locate the unit when you lose power. In addition, it may be charged with the included USB adapter or optional 120V AC charger for up to 8 hours of operation. The Eton FR1 is great for camping, fishing, travel or the home, garage, office, or industrial maintenance; and is perfect for any emergency preparedness kit. 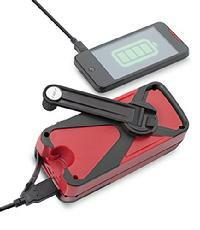 Dyamo charging unit with internal rechargeable and replaceable Lithium Ion battery. Wind-up handle can be cranked in either direction. Folds and stores on side of flashlight. Telescopic antenna conveniently retracts into flashlight body when not in use. Constructed of high-impact ABS plastic. Unit dimensions: 5.5" length x 2.5" width x 2.5" thick. Unit weight: 8.6 oz. Other applications: Add to your home, business, church, or school emergency kit! 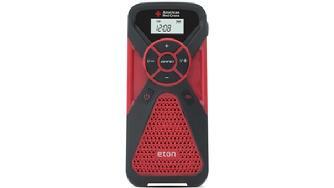 339-7301 - Suggested Retail for the Eton FR 1 Wind-Up Emergency Flashlight and Digital Radio is $44.95 each. - Now on Sale for $39.95 - Save $5.00! Ships Immediately.